A ferocious parrot, feared and hunted by farmers for decades. It is the notorious reputation of the kea (Nestor notabilis, Gould, 1856), the world's only omnivorous and alpine parrot. In 1904, Johannes Gerardus Keulemans, one of the very best bird illustrators, made a unique watercolor of these remarkable birds. We are happy to say that this beautiful watercolor is on view in our gallery at 1016 Madison Avenue, New York (ill. 1). Kea are known for their great intelligence and curiosity, both vital to their survival in a harsh mountain environment; they are even capable of preparing and using tools. The bird is endemic to the South Island of New Zealand. Their name “kea” derives from Māori and is most likely an onomatopoeic representation of the bird’s in-flight call. When farmers moved to higher ground in the mid-1860s, their sheep began to suffer unusual wounds on their backs. The cause turned out to be kea using their powerful, curved beaks and claws to rip through the layer of wool and eat the fat from the back of the animal. 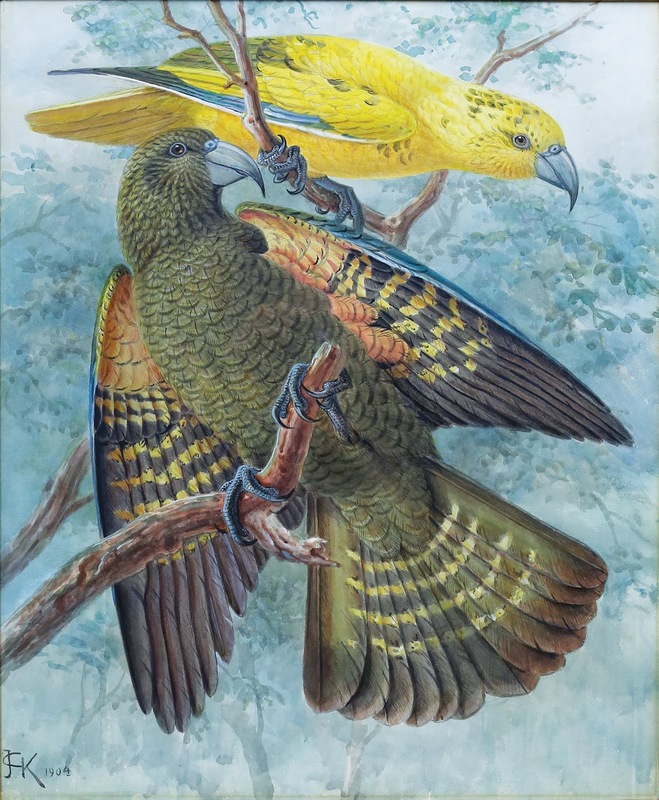 In order to stop the kea preying on livestock, the government paid a bounty for kea bills and in the following hundred years more than 150,000 were killed, until the bounty was lifted in 1970. By then, however the kea population was left to only 5,000 birds, consequently receiving full protection. Nowadays, the parrot is still considered endangered due to treats of introduced predators, lead poisoning, and pesticides. The birds' naturally trusting behavior towards humans has made them a popular tourist attraction, although their cheekiness and mischievousness also results in trouble-making behavior, such as the chewing of rubber from cars. Golden kea were scarce in the nineteenth and twentieth century. The killing of kea and higher prices for these specimens made mutations even more exclusive. Nowadays only one golden kea in the wild exists. With this watercolor, it seems like Keulemans actively tries to positively change the reputation of the kea, by showing the beauty of the parrot in a way that has not been done before. Walter Lawry Buller, Supplement to the ‘History of the birds of New Zealand’, London (1905), vol 2, p. 76, 77. Johannes Gerardus Keulemans, A Wildtype and Golden Kea Perching on a Branch, 1904, watercolor on paper, 16 1/2 x 21 in.